Discussion in 'The Duck Hunters Forum' started by Fowler267, Aug 12, 2018. 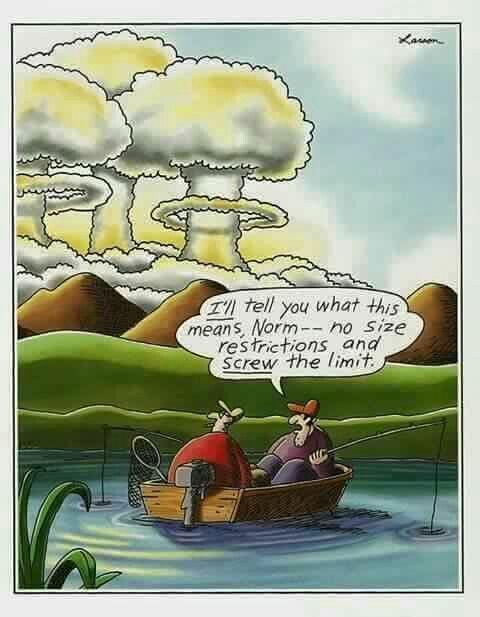 I have always loved "The Far Side" cartoons! My favorite one is a couple ducks at a bar and one is bandaged up... The other asks if he will tell his wife how he got shot? Heck no! First thing she will ask is why I was looking at another duck! I can't find a copy of that one... But I always figured Larson must have been a hunter and lived on a farm at one time? Always figured DU etc could raise money selling framed cartoons at banquets! Huntges11 and Huntsprig like this. 2 deer hunters come across a deer "bed". The eldest tells the younger one how experience will one day help him learn what to look for. Never mind that the bed area has pic of the deers mom, a lamp, mattress and other such stuff. Ya can't get 'em if ya ain't there! Appointed the Esteemed President of the "Illinois Diver Ducks' Don't Dally Club" by Dan Earleywine, aka "Greybeard". Pure genius! Larson was way ahead of his time. Hard to pick a favorite. He mastered the art of pointing out life's absurdities in a way that made you smile. I have to believe he was a hunter. Anyone know? His hunting-related comics were right on the money. A non-hunter would never be able to come up with that stuff. This could easily be changed to duck hunters. BADLARRY250, Silver Wings, DuckAssassin870 and 4 others like this. onjig, BADLARRY250, Mort and 8 others like this. Beat me to it - favorite of all time, even have a coffee mug and shirt with that. Red meat is not bad for you, it is the green fuzzy meat that is bad for you. I do have a copy of his only book - as far as I know - called "there's a hair in my dirt". He published several book that were collections of cartoons, but this is the only complete story that I know of. Sort of an adult cartoon book about a family of worms. Very Macabre, very Larson. Mort, TheDuckSlayer, Ducker 4 Ever and 7 others like this. Ducker 4 Ever, Fowler267, stevena198301 and 1 other person like this.